SALT LAKE CITY — The snow fury that hit Utah Sunday seemed to be quieting down by late Sunday evening. Both a winter weather advisory and a wind advisory were issued for most of Utah around 3 p.m., Sunday, according to KSL Weather. The winter weather advisory was expected to remain in place until early Monday morning. "Now showers are going to get a little quieter," KSL TV meteorologist Dan Guthrie said Sunday evening. "We talked about how the storm was sort of front loaded, where the first two to three hours is where we'd see the moderate to heavy snowfall. For most of us, that's passed through." Although things slowed down a bit late Sunday night, it was not without first taking a hit on Utah's drivers. In Summit County, westbound I-80 reopened around 9 p.m. after closing for nearly an hour just west of U.S. Highway 40, according to UDOT. Sardine Canyon near Logan saw whiteout conditions late Sunday evening, with slick, snow-packed roads. Logan City police dispatchers reported on Twitter that they had multiple cars slide off the road, and recommended not driving on state Route 30 or in Sardine Canyon without chains or four-wheel drive. The Logan dugway, the connection of 600 East from 400 North to Canyon Road, was closed Sunday evening. Multiple cars and semi’s are stuck and stalled on SR 30. Please do not attempt to use SR 30. Stay home and watch the grammy’s! There were notable delays late Sunday on I-15 between Draper and Lehi, where cars were slowed due to low visibility and multiple minor accidents, according to UDOT. As of 11:10 p.m., both visibility and traffic were still bad in Lehi, according to UDOT's traffic report. Drivers on I-15 between Cedar City and Scipio were advised to only drive with chains or snow tires. Westbound state Route 14 in Kane County was closed to semitrucks as of 9:30 p.m., as was Markagaunt High Plateau Scenic Byway near Cedar City, according to UDOT. Northbound Bangerter Highway closed at 6200 South at about 8 p.m., according to a tweet from UDOT. As of 9:30 p.m., the road appeared to be open, with traffic flowing. The area surrounding Little Cottonwood Canyon also saw significant delays due to snow, which were expected to be cleared about midnight, according to UDOT. The Salt Lake City International Airport delayed multiple flights as they worked to de-ice the runways, and a couple of incoming flights were canceled, according to a recent tweet. By late Sunday evening, storm activity was mainly concentrated in southern Utah. "By two or three in the morning, shower activity will be completely done with the exception of just a few spots in the mountains. 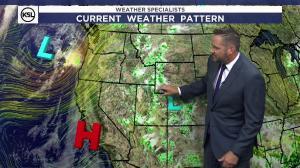 Southern Utah is just getting in on it right now, so they're gonna see the peak activity here for another hour or two, and then after midnight they'll start to see their shower activity wind down as well," Guthrie said. Valley snow Sunday afternoon reached between 1 and 3 inches; overnight, however, 3 to 5 inches of new snow accumulation is possible, according to the National Weather Service. A south wind of about 26 mph breezed through Salt Lake County in the afternoon, National Weather Service reported, occasionally with gusts as powerful as 40 mph. Overnight the wind will slow to between 7 to 16 mph, coming in from the northwest. The mountains were an entirely different story. As of 11:20 p.m., the National Weather Service showed that Snowbird and Alta ski resorts got 11 inches of snow, and were expected to get 8 to 12 inches overnight; Park City Mountain Resort got seven inches, and 3 to 5 inches were possible overnight; Brighton and Solitude saw 7 inches of snow, and were expected to see 8 to 12 inches before Monday morning. Monday morning skiers along the Wasatch Front can expect a chilly day with strong winds, with wind chill values between -6 and as low as -20 in some places, according to the National Weather Service. At Snowbird, winds will remain at 26 to 28 mph for most of the day, and might get as strong as 41 mph. Drivers have been advised to not park vehicles on the street overnight so plows can clear the roads. Expect some lingering winter driving conditions throughout the state Monday morning.